A friend recently posted on Facebook that she was at Quilliam Brothers’ Tea House in Newcastle’s Haymarket, where she was drinking “posh tea”. I’ve not yet visited myself, as it’s not a part of town I get into very much, but I’ve passed by a couple of times and also visited the website, and whilst it seems like a really nice place and I’ve heard several recommendations, “posh” is not a word I’d use to describe what I’ve seen. To me, a posh place is somewhere you worry about doing or saying the wrong thing, or using the wrong knife, or something, and from what people have said, Quilliam’s seems more relaxed and friendly than that. “Quirky” would, I think, be my choice – although any establishment specialising in tea, given our coffee-obsessed society, could be seen as out of the ordinary. When I enquired what made it “posh” my friend gave several reasons about the decor and the menu which I feel say more about her own perceptions, but I suspect that nowadays many people view the use of teapots and loose-leaf tea as unusual and, indeed, “posh”. As an avid tea-drinker who has tasted enough of the results of different brewing processes to have an informed opinion, though, I’d definitely say that both teapots and loose-leaf tea are fundamental to achieve the best brew (we’re still using teabags in our house, owing to the fact that leaves are difficult to get rid of when you only have one teapot, but I can’t deny they do give a better flavour). Unfortunately, these days most cafés, restaurants and even some self-styled “tea shops” fulfill an order for tea with a mug of super-heated water with a teabag either on the saucer beside, or floating in the top. Last year I saw a sketch on the comedy show Watson and Oliver which gently poked fun at those who long for a “proper cup of tea”. I wanted to link it here but can’t find it online anywhere. The sketch depicts a customer who, on being presented with the sort of arrangement I’ve just described, begins a stirring speech about the loss of real tea as symptomatic of the general erosion of Englishness – as further evidenced by another customer who is eating an American muffin instead of one sold by the Victorian-style salesman who comes in from the street. In the end, everyone is won round and the customer repeats her order for a tea to take away, leaving fully laden down under a full tea set, spoon, strainer and all, happy despite her difficulty in avoiding being scalded by the teapot! Clearly, the full tea experience isn’t always compatible with our busy, perpetually mobile, lives, which I believe is one of the reasons Afternoon Tea (or its equivalent at other times of day) has taken on such a significance in recent years. The opportunity to take time out to enjoy good food and a relaxing drink feels like a little luxury, which is why it’s a disappointment if things aren’t quite up to scratch, as I’ve mentioned above. I thought I’d share two experiences I’ve had recently of really good tea places. We first discovered The Fourteas by chance whilst on holiday in 2013. 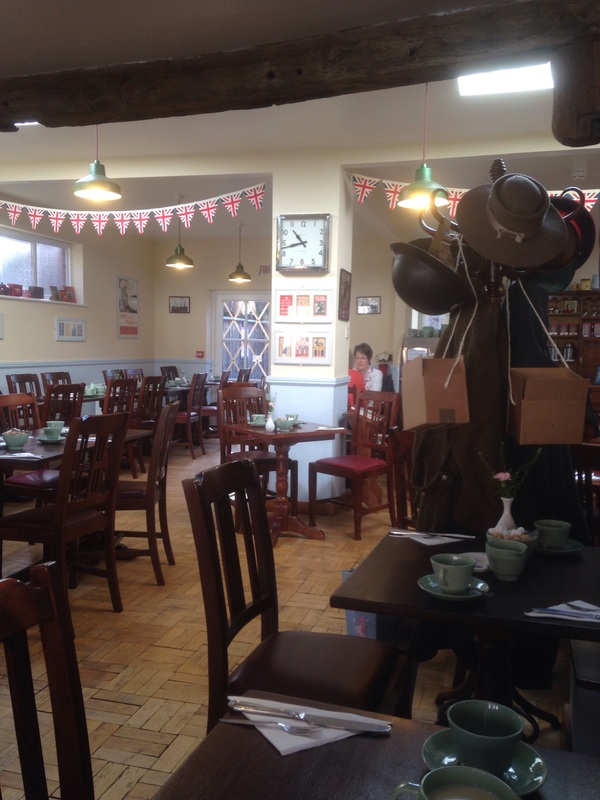 It’s a tea-room in Sheep Street, Stratford-upon-Avon, where everything, from the decor, via the waitresses’ uniforms, to the menu choices, is inspired by the 1940s and WWII. The first time we visited we enjoyed an Ivor Novello afternoon tea, which comprised everything you’d expect – sandwiches, cakes, scones and of course tea. At the Fourteas they take tea very seriously indeed, and want you to enjoy it at its best, so loose-leaf tea is used in a filter cup which fits inside the pot. The pot is delivered with an hourglass timer (different durations depending on the blend) and instructions to wait until the time is up, remove the filter and place on the tea-pot shaped saucer provided, before pouring the tea. It’s definitely worthwhile and I’d like to find a filter to use in my own teapot (you can buy a set of pot and filter to take away, but having acquired a new teapot only a year ago I’m not really in the market for another!) Since our first visit there I’ve longed to go back, and I was lucky enough to get the chance last week. My parents’ Christmas present to me and Southern Daddy was an overnight stay in Stratford, including tickets to a play (Love’s Labours Won – usually known as Much Ado About Nothing – which I’d strongly recommend. If you can’t get to the RST it’s shortly to be broadcast live to several cinemas around the country, so go and see it!). The following morning we went to The Fourteas for brunch, and both thoroughly enjoyed a Monty’s Breakfast, which felt particularly well-deserved once we’d walked down into town from our hotel. The tea in particular was most welcome! A more local find has been Delicious Decadence in Jesmond, north Newcastle (sorry no photos as yet, but I found this blog which has a good review and some pictures!) SD and I visited last year with a Living Social voucher for a choice of breakfast dishes, which are served throughout the day. Despite having a really lovely time, we hadn’t got round to returning until this week, when I was considering birthday present ideas and remembered seeing that Delicious Decadence had started serving afternoon tea. I emailed Kate, the owner, about the possibility of buying a voucher for pre-paid afternoon tea, and she assured me that would be possible, so a few days ago I took a friend for lunch there and to pick up the voucher at the same time. Delicious Decadence is a sweet and tiny café (6 tables, I think, although the first time we went was summer/autumn and there was another table outside on the pavement) with a very relaxed, welcoming atmosphere and a menu that is extremely good value compared to other, similar establishments I’ve visited around the city. My friend and I both had a sandwich served on half a baguette, containing our choice from a selection of fillings, with crisps, coleslaw and a small salad on the side. Afterwards we decided to treat ourselves to some cake from the enticing array on the counter – my only small disppointment was that the buttercream was too sweet, but this was really my own fault as I know I don’t like buttercream and only really chose the cake because my friend was having trouble choosing between the orange and the blackcurrant sponges, and I selflessly suggested we take a piece of each and share! Along with all this we had tea, of course – there’s a huge list of options displayed on a blackboard behind the counter which extends even to chai lattes or the interesting-sounding “Fog on the Tyne”, comprising Earl Grey, vanilla syrup and steamed milk. Our much more traditional tea came in a substantial-sized pot which kept us going throughout our lunch. Whilst I was paying, I took the chance to chat to the very friendly Kate about the outside catering service they offer, so that I can bear it in mind for SD’s 40th birthday party in the summer. It sounds like a promising plan! As soon as we left, my friend and I were discussing when we might make our next visit, and who else we could take who might enjoy it. I’ve since bought a Groupon voucher for afternoon tea there, and hope to return soon – the only difficulty is that it’s becoming so popular I’m struggling to book a table! Following on from my (relatively) recent post, where I rounded up things I’d been enjoying, here’s more information about some of the web-series I’ve seen, and my thoughts on them. Since The Lizzie Bennet Diaries came to an end I’ve investigated several more similar series. Some I haven’t really got into. Some I’ve persevered with despite their failure to live up to early promise. I’ve just finished watching Pemberley Digital‘s latest venture, Frankenstein M.D. and was inexplicably disappointed, since they were only being faithful to the original (or, at least, I think they were, I’ve only read the Ladybird version and that bothered me enough – not in a scary way, just a sad way – that I never wanted to read the real thing). One thing’s for sure, LBD has set the bar very high for other attempts! The ones I’ve really enjoyed this year are Nothing Much To Do, an adaptation of Much Ado About Nothing set in a modern-day New Zealand high school, and Classic Alice. NMTD interested me as the original play is one of my favourite Shakespeare works – I’ve been in it, studied it for A-level and seen about 6 or so different productions. The series has finished now (I think – a couple more little episodes have popped up since I thought it had ended) but of course all the episodes are still there, and there’s a playlist which helpfully presents them in the correct order. What’s great about it, apart from the fact that the updating process has been really well thought through, is that it was broadcast on several different channels to represent the various points of view of the characters (who weren’t always watching each other’s videos), and to highlight the accidental way in which Dogberry and Verges become involved in unravelling the plot (and I adored their homage to Sherlock, including kazoo theme music). The makers (The Candle Wasters) have promised a follow-up, Lovely Little Losers (loosely based on Love’s Labours Lost), in due course, so I’ll be looking forward to that. Classic Alice isn’t an updating of a book as such, but centres around a creative writing student who decides to live her life according to the decisions made by characters in various classic plots, following each through to its conclusion before embarking on the next. Her friend Andrew who is studying media (or something) is filming her for a project and he also gets involved in the stories, as does Alice’s roommate Cara, and a range of other characters. So far they have worked through Crime and Punishment, Pygmalion, The Butterfly, Macbeth and The Wind in the Willows but cleverly the plot created by their responses to each of these is ongoing and continues to develop despite each book’s coming to an end. I’m not great at following the transmedia bits of the shows on Twitter, Tumblr and the like (what is Tumblr even for? ), so I’m sure I’m not getting the full benefits, but the Facebook pages tend to link to the most significant tweets, etc, so I’m not missing anything important, and my main interest is the updating and presentation of the stories. One more that’s just getting going is In Earnest, a version of Wilde’s The Importance of Being Earnest. The first episode is DULL, but give it a chance because it’s warming up OK and the actor who plays Algy is especially good. This is one I think would benefit from the multi-channel approach – having everything broadcast on one channel is convenient to find, but doesn’t really make sense within their universe – and it seems a lot less “real” and more of a performance than some of the others, but is nonetheless engaging and entertaining. Swifter than arrow from Katniss’s bow. It’s my 40th birthday in December, as I’ve mentioned before, and obviously it’s an important event. Unlike some people, I’m not unhappy about it (a school friend recently posted on Facebook that she was “drowning her sorrows” in the face of turning 40!) and do want to mark the occasion, but maybe not in the “bucket” list (how I detest that term! ), once in a lifetime experiences you see suggested on the internet, like doing Machu Picchu or swimming with dolphins. Whilst I haven’t had an official list of Things I Must Do Before The Big Day, I’ve made a couple of significant (to me) achievements. The first is that I have now attended concerts of the whole of Wagner’s Ring cycle. My best uni friend and I have been meeting up once a year in Salford Quays for the last four years to see Opera North perform the Prologue and Trilogy of operas that make up the sequence. I wasn’t sure what to expect when we first started but we’ve both really enjoyed the experience and feel that it’s a suitable induction into Real Adulthood! The performances are different from what you would usually get in an opera, as they’re in a concert setting as opposed to a fully staged setting, meaning that the singers are not in costume (although sometimes they wore something to give a clue to their character or to use as a prop, such as a red handkerchief which would be pulled out of a pocket if the character was killed) and stand or sit at the front of the stage, rather than acting, and also with the use of a video display behind the performers which added extra atmosphere, with footage of water or fire or trees, etc, depending on the scenery. This display also shows some narrative text, to keep the audience following the story (in the absence of any real acting) and all the surtitles to translate the German into English. I really liked this setting and found it helpful, as well as enjoying seeing the orchestra on stage with the singers (although it was sometimes a bit of a squash, especially in Götterdämmerung when a 50-person choir was also required!). For each performance we both found that it took a while to “get into” the story and the music, but that after about 20 minutes or so we became more immersed in it. One performer we really admired was Mati Turi, an Estonian who played Siegfried in both Siegfried and Götterdämmerung. He was so involved in his character and his face showed such life and feeling it was hard ever to look away, even to read the surtitles! I was really pleased that he returned for the final opera, as he hadn’t been going to but the original choice pulled out, and it really made the night for me. It’s been so much fun having our little weekends away that my friend and I plan to carry on having them, and are now looking for ideas of what to do or see next! My second achievement is to have visited all six branches of Bettys. Bettys Café Tea Rooms are a Yorkshire-based company started in the early 20th century and have retained their Edwardian atmosphere and standards. It’s always a real treat to go there, which is why I’m having my birthday celebration there in a few weeks. That will be at the larger York branch, my favourite Bettys, but I realised a little while ago that there were several I hadn’t visited. Southern Daddy took me to the original Harrogate branch on a day out when we were newly-married, and growing up I used to go quite often to York with my family. I finally visited the Ilkley branch a couple of years ago (that’s a particularly lovely place, especially if you can get a table with a view out of the window), which left three. Southern Daddy and I called into Northallerton after dropping the girls off at camp this summer. We were lucky to find only one family queuing ahead of us – I don’t know if this is usual here but it’s certainly a change from the hour + waits you can expect in York and Harrogate! Northallerton Bettys won the Tea Guild’s “Top Tea Place” award in 2012 and it’s certainly a great place. It has the feel of a Georgian summer house or garden room, older in style than some of the other branches, and it felt very relaxed despite being full and busy to the extent that they had run out of scones! The next branch we tried was at RHS garden Harlow Carr just outside Harrogate, at the end of August. We were returning from a weekend at my sister’s on the Bank Holiday Monday and decided to make the detour for tea. When we arrived, later than we’d hoped, we wondered if we’d be able to get in as it was less than an hour to closing, but actually we were seated with no queuing (!!) and treated as if everyone had all the time in the world, finally leaving a full 20 minutes after the stated closing time. In the busy world we inhabit, where everyone has something else to do and even National Trust café staff are putting chairs on tables around you if you outstay your welcome, this was a real pleasure. My only disappointment was that we didn’t have time to make our usual visit to the shop for take-home goodies, because it was closed by then, of course. Finally, we visited Bettys of Stonegate, York (formerly known as “Little Bettys”). This week just gone was the half term holiday for us and, after another visit to my sister’s to see our Gran on her 90th birthday, we had an afternoon out in York, taking in a bit of shopping and a trip to the Treasurer’s House, too. We decided we’d try and get lunch in Bettys, so we joined the queue for about half an hour before being shown to our table. 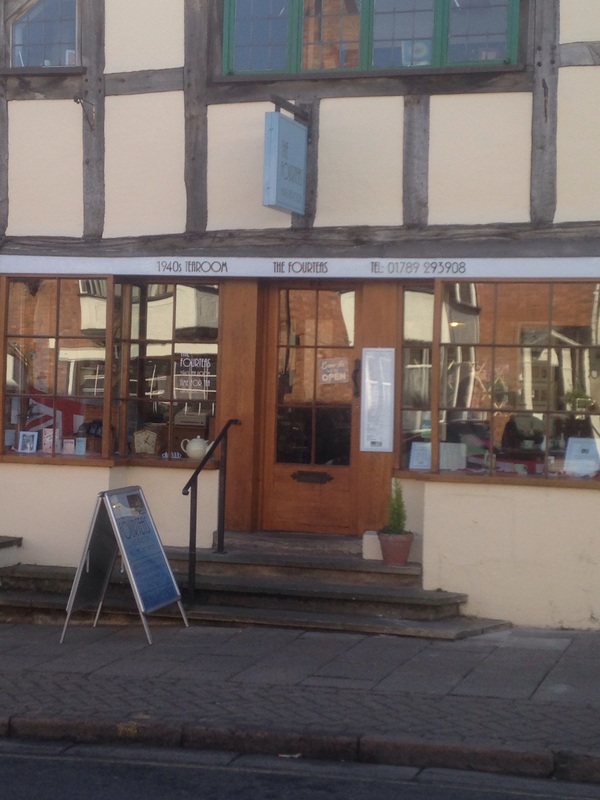 This branch has its tearoom upstairs and shop downstairs, and it has a very quaint and cosy feel to it. 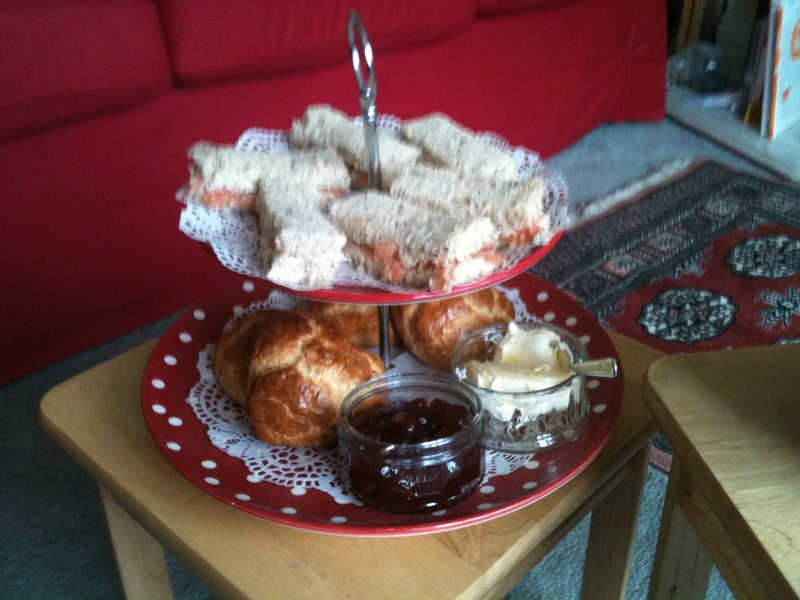 We chose sandwiches and tea, and afterwards viewed the cake trolley to select something for our dessert. It’s not cheap but it’s definitely a lovely treat and worth the wait. I have had other ideas for things to do before I’m 40, such as watching a film I’ve never seen for every year of my life, but I just haven’t had the time! I have exactly 5 weeks to go now, so I’m open to suggestions if you have an idea I could do quickly! So I’ve kind of got out of the habit of blogging. There are 2 main reasons for this: the first is that I now have a newer iPhone. This is much better, and quicker, at accessing everything Internet-related than our laptop, which is now on the older and creakier side, so I only really switch on the laptop when I’m word-processing. However, the WordPress app for iPhone is A PAIN, chiefly because whilst writing is fine, anything else (linking, adding pictures) is a really struggle, so if I think of blogging I have the choice between awkward app and laborious laptop, and neither tends to appeal. The other reason is just that I have’t thought of it as much. I used to have thoughts that I wanted to share, things I’d seen that sparked off a chain of ideas which came together on the page, but lately that hasn’t happened so much. It’s not necessarily a bad thing, as in some respects I’m just living my life, rather than looking at it through the lens of how I’ll report it later. But I do still want to record and share things, so I’ll do that sometimes and maybe get back to being a more frequent blogger eventually, or maybe remain as an occasional one. Over the summer I’ve enjoyed a lot of things. Here’s a round-up of the best, some of which I’ll describe in more detail in future posts. Meeting up with all my family, on my dad’s side, at my Aunty’s 75th birthday party in July. I wasn’t looking forward to this much. As a family we’re not into big regular get-togethers in the same way as Southern Daddy’s family is, so the last time I’d seen some of these people was at my sister’s wedding in 1999. Now, that’s not a problem in itself, and obviously we’d have plenty to catch up on from the last 15 years, but I’m not great with people I don’t see on a regular basis – my dad’s neighbours and church friends, mainly – because of one main reason: they can’t tell me and my sister apart. I don’t know why this is. We don’t look alike – I am short with brown eyes and look like my mum, she is tall with blue eyes and doesn’t look like anyone much. I studied languages, she studied sciences. I married my university boyfriend and we live in the North East with our two children, she married her school boyfriend and they live in the North West with their three children. Her in-laws live round the corner from my dad, my in-laws live at the opposite end of the country. And so on. But for some reason people can’t remember which one is which, who recently had a baby, who’s the linguist, etc. So there I was thinking that if people I see a couple of times a year can’t work it out, what hope do we have with people I haven’t seen for over a decade? Plus the fact that people like to point out that I look like my mum, which might be interesting/exciting for them to notice, but for me it’s boring and also annoying after almost 40 years of these comments. The Bookworm already has to put up with this too. So anyway, we went to the party, and guess what? It was lovely! And amazing. Everyone knew who I was – because of course (as I realised later) we family, and they all (with the exception of my youngest cousin) remember me from birth, with my proper name and who I am! And they knew Southern Daddy’s name, and the girls’ names too. We had a delightful afternoon tea in my eldest cousin’s garden and the weather behaved perfectly the whole time, and we all chatted on and on, and we tried to leave about three times before we made it to the car without being waylaid by someone else who wanted to talk! And the best part of all? Everyone there looked like someone else – in fact we’re all just turning into the generation above us. My aunty has turned into my Grandma, my dad into my Grandad (which I hadn’t noticed till I saw him next to my aunty! ), my cousin’s children are all turning into my cousins. And nobody mentioned it at all. Attending a performance of Götterdämmerung to complete Wagner’s Ring. My best uni friend and I have been meeting up once a year to see part of the Ring cycle, and we’ve now managed the whole thing! The Bookworm moving from primary to secondary school. The Bookworm’s year in our tiny primary school went out in a blaze of glory, paired as their final year was with the school’s 120th anniversary celebrations. This meant exciting activities all year through, culminating in the school play at the end of the summer term. Usually this is based on a popular children’s book, with the Year 6 pupils taking the lead parts and the rest of the school coming on in groups to play lesser parts (anything from Indians in Peter Pan to chocolate bars in Charlie and the Chocolate Factory, depending on age), but this year the play was a retrospective of the school’s history. All the parts were played by Year 6, with other years coming on to perform a dance, each representing a different period of history. We saw Edwardian chimney sweeps, 20s flappers, 50s rock’n’rollers, 70s disco dancers, 80s pop-steppers and 90s ravers (the Butterfly’s class dancing to Rhythm is a Dancer). The Bookworm played the part of the school bell, narrating everything she’d observed over the development of the school from then till now, and it was all fantastic. We have it on a DVD, I’m glad to say. Her transition to secondary school has been smooth and relatively straightforward, despite the journey being a fairly long one each day and very few of her former classmates moving to the same school. It was a difficult decision and it’s good to know we made the right one. The Handlebards’ second tour. After last year’s wonderful experience we were keen to see the Handlebards again this summer. Sadly, the UK tour was in the opposite direction (south to north), meaning that there was no way we could get to Stratford for another visit to The Dell. We opted to see them in early July at the Cycle Hub in on Newcastle Quayside instead, and we were not disappointed! It was a much more intimate performance as it took place in the small café seating area outside the hub, so it had a different feel – especially with the noise from boats down on the river interrupting at times (but only adding to the comedy!). We saw The Comedy of Errors this year, we sat with friends (one of whom got to take part as an impromptu extra), we had a fun picnic… we’re already looking forward to next year! Visiting 3 different branches of Bettys! I’ve always loved a trip to Bettys, and this year I decided was the year to try out some branches I’ve never visited. A holiday in Norfolk. We hadn’t realised when we booked it, but the holiday rental this year turned out to be part of a Country Club resort which reminded me very much of Kellerman’s in Dirty Dancing! Most of the time we were out and about exploring the local area, but there were activities provided all week for families and we took part in a couple. The Bookworm came second in the scavenger hunt which meant that we had to go to the awards ceremony and get-together on the last night, so she could be presented with her medal. As we all sat there in the bar, in our little family groups, I couldn’t help expecting Patrick Swayze to turn up, complaining about Baby’s being put in a corner and asserting that he always did the last dance (it didn’t happen, despite the entertainment leader’s name being Johnny). Our trips out and about were wide-ranging and varied – a boat trip to see seals, our first attempt at geo-caching (which resulted in our getting rather wet in a sudden storm! ), crabbing on Blakeney pier – and even our usual stately home visits had a different feel. We’ve been members of the National Trust for many years, but until recently we’ve definitely been a “lunch in the restaurant, trip round the house and adventure playground if you’re good” kind of family, as mine was when I was growing up. But last year our eyes were opened to more possibilities. Whether it was the good weather, the fact that our children were growing up or just the increasing range of activities dreamed up by the events team, we ended up spending almost a whole day at Nostell Priory on our way home from holiday – from just after opening time to just before closing. I’ve never really been an outdoorsy person but there was just so much to do! This year we visited Blickling, Oxburgh and Felbrigg Halls, as well as Sheringham and Clumber Parks and Peckover House, and on each occasion could have stayed there the entire day (at Blickling we did, and still had more we could have done before we came away!). There are self-guided garden tours, scavenger hunts and trails for children (indoors and out), second-hand bookshops to browse and giant garden games to play (think Jenga, draughts, snakes and ladders, connect 4 but on a larger scale) at all the places we’ve been this summer. At Felbrigg there was a box of traditional toys such as skipping ropes, hoopla and balls and cups. In addition, the 50 things to do before you’re 11¾ scheme means that most places are offering the chance to do some of the 50 things on any given day, from tree-climbing and hill-rolling to nature art and bug-hunting. One of my children has now passed the 11¾ milestone but doesn’t mind continuing to participate, and I can see us being members of the National Trust for many years to come, since if anything we’re getting more out of it as time goes by. And some of them are ideally placed for a stop on a long journey that’s much more enjoyable than a motorway services! New web-based TV series. Since The Lizzie Bennet Diaries came to an end I’ve investigated several more similar series, some of which I like and some I didn’t so much. Reading some great books. As usual I’ve been doing lots of reading over the year, and have some thoughts on some of the books I’ve read. Cooking and baking. I enjoyed watching Mary Berry’s cooking series earlier in the year and have managed to find some of the recipes published online. Her lamb dhansak is a particular favourite for a Saturday tea in our family now and it was such a surprise to my spice-hating Butterfly to find she liked it, that she’s been able to try some other new dishes off the back of it, on the grounds that she might like those too! I’ve also made Mary’s Very Best Chocolate Fudge Cake several times this year, including for each of my daughters’ birthday cakes! We all enjoyed the Great British Bake-Off too, and I’ve been baking a lot from Recipes from a Normal Mum, a book by Holly Bell who was a finalist in 2011. A friend and I were lucky enough to go and meet Holly at an event locally, where she was interviewed, signed our books and chatted whilst we enjoyed various cakes and goodies made to her recipes by the hosts of the event. One of my favourites is the Turkish Delight friendship cake, which isn’t available online, I’m afraid, but comes highly recommended! That’s it for now – hopefully a bumper post with several little off-shoots should make up for the long silence! A few years ago, when the Bookworm was small, my sister and music-loving brother-in-law bought her a CD and DVD set called Here come the ABC’s by the band They Might Be Giants. It’s a fun approach to letter-learning, with a quirky sense of humour, and we’ve enjoyed listening to it and watching it over the years. My favourite song is Alphabet of Nations, which lists a country for every letter of the alphabet (including a surprising idea for W and X!) and I love the music, which has a very patriotic feel to it! This gift was followed up some time later with Bed, Bed, Bed, a book and 4-song EP set, which the girls also listened to a lot (although probably not as much as Here come the ABC’s). I believe Here come the 123’s has also been released now, although my girls were a bit old for it by the time it came out. Anyway, without knowing very much more about They Might Be Giants (apart from remembering Birdhouse in Your Soul being popular in my youth) I started following their Facebook updates in gratitude for those children’s CDs, which make such a difference in the life of a parent whose personal music interests have had to be set aside almost completely in favour of nursery rhymes and audio versions of picture books. I see their posts from time to time, usually announcing extra tour dates in obscure American towns I’ve never heard of, occasionally announcing a new track or album available (once we all had to download Birdhouse in Your Soul to see if it could get to number one, but it didn’t. Fun though). Today they are trying something new and I’m seeing if I can participate. They are giving away free an entire album, as tracks recorded live on their tour last year, to anyone who requests it. In return they would like people to share the opportunity with others, on Facebook or Twitter, or in a blogpost. First of all you need to add downloads@theymightbegiants.com to your email address book (they are pretty clear that it will not reach you if you don’t!). Then use the widget to send your details to get the download code. I’m afraid my lack of technical skills is preventing me from getting the widget to embed on this page as desired, but if you click the link below you’ll see the widget and it’s still clickable and workable! After you’ve done that you can use the bottom part of the widget to share the news with others too! I have mine downloading now – hope it works for you! Photos will appear once I’ve remembered to stop and take some, rather than just getting on with it every time! I’ve already explained that one of the aims of the Year of the Magimix was to see if I could make better bread by hand than by using my breadmaker. Since then I’ve been working quite hard to find a recipe that would work for me, so that I could make the kind of bread my family would want to eat on a regular basis. At first it seemed that I was not going to be able to use the food processor for the kneading stage, which I was disappointed about because I had hoped that would be another purpose for having it out on the counter all the time, but the size of mine means that most recipes for ordinary sandwich/toasting loaves make too much dough for the machine to handle. I began making it completely by hand, which at first I enjoyed because it gave me a sense of achievement, but then I began to notice that the weather, and the humidity in the kitchen, made it difficult to predict how the dough would turn out and how long it would take to knead. I’ve read that it’s important to the texture of the bread to add as much of the water in the recipe as possible, so I did do this, but on occasions I was getting so tired from working the dough for 20 minutes or more and it didn’t seem to be getting any less sticky or any more stretchy! It was time consuming, difficult, unpredictable and, besides everything else, I found the sensation of scraping the wet dough off the board with my fingernails deeply unpleasant. I was on the point of giving up the idea of making my own bread when – for the sake of speed – I used a packet bread mix and mixed it in the food processor. I began thinking about how the quantities of flour, etc, still yielded a 2lb loaf (or at any rate a loaf cooked in a 2lb tin), despite being smaller than the recipes I’d been trying. I searched for a recipe with a smaller quantity of flour and tried it, with some success. I think it’s the maximum amount of dough my machine can manage (400g flour) because it tends to get a bit hot during kneading, but I find this contributes to the speed of the first rise, so all to the good – and the machine’s only cut out once from overheating, when I left it going too long! It’s taken another few weeks of working and tweaking to get it the way I want it, and of course weather and humidity are still variables which make the end result slightly unpredictable. Sometimes it’s fantastic, sometimes it’s fine but nothing spectacular, and I’ve accepted that that’s beyond my control but at least I don’t have to do any more fingernail scraping or risk becoming too muscle-bound! 400g strong bread flour – any kind, or a mixture. Whilst I was struggling with too-dense wholemeal loaves (the kind we eat most often) it was suggested to me by many that I should substitute about 25% with white flour to lighten it, but this seemed like cheating to me! Thankfully I’ve found other ways of lightening the loaf (see below) but I do sometimes mix in 50-100g multi-seed flour with my wholemeal, just for variety! 2 tsp easy-blend/fast-action yeast – I’ve read up on my yeast as I really didn’t understand the differences, and this is the easiest kind to use. It comes in sachets (in which case just use 1 sachet) or little tins or packs like mini packs of coffee (more cost-effective than sachets if you’re using it a lot) and you don’t have to soak it or anything, just put it straight in. 2 tbsp oil – Olive oil is nice in wholemeal, but you can really taste it in white bread so use a flavourless oil or just leave it out. It helps to lighten the bread and keeps it moist longer, but it’s not essential. 270 ml tepid water – This is the amount for pure wholemeal, which I make most often. If you’re making white bread you’ll only need 220ml and you might want to make your own adjustments for the climate, etc, but these work for me. Fit the dough blade in the food processor and pour in the flour. Add the yeast in one side and the salt in the other so they stay apart till the last minute. Pour in the oil and the water [swoosh it round the bowl to try and make sure all the flour is dampened – for some reason my dough blade has quite short arms and it’s easier to get all the flour mixed in if it’s all wet first], then fit the lid on and switch on to process for 5 minutes [you’ll probably need to stand nearby and make sure the machine doesn’t fall off the counter as it tends to jump around quite a lot!]. Lightly grease a large bowl with more oil [really lightly is fine, I just use the dregs of oil left in my measuring cup, wiped out on some kitchen roll and spread round the bowl], then scoop out the dough with oiled hands and shape it into a ball, which you put in the bottom of the bowl [if the dough is more sticky and won’t come out all in one go, scoop it out with a spatula and pat it together with your hands in the bowl, then lift it up and shape it into a ball]. Cover with cling film and leave for the first rise, until the dough has doubled in size, which will take around an hour, depending entirely on the temperature in your house. I have a dedicated “proving corner” in my kitchen, namely the top of the cat food storage container, which sits quite near, but not too near, the radiator – it’s warm (either from the radiator or the weather) and sheltered from draughts and has the advantage of being visible when you pass the doorway, so you don’t forget about it unless you go off and watch back-to-back episodes of The Office all evening. I once managed to make a loaf from start to finish in 2 hours (which was lucky as it was all I had before I needed to go out) because it was a very warm day! When this has happened, remove the cling film (keep it though, you need it again – waste not, want not, and all that!) and scoop out the dough, which will immediately deflate as you puncture it. Put it on a scantily floured or oiled board and punch it with your fist to flatter in it out, then fold the edges into the middle, flip it over and repeat. Try to flatten it into a square and then fold both sides into the centre, pressing down on the join to give it better structure. Oil your 2lb tin and place the folded dough into it, tucking the ends under first and pressing them down if the shape is too long for the tin. Cover with the cling film and leave to prove. Preheat your oven to 220C or 200C for a fan oven. Keep a close eye on the dough – from experience I’ve learned that what you want is to catch it just as it reaches the top of the tin, especially for a wholemeal loaf (white ones are far more robust). If you leave it till it’s all round and risen and towering above the tin, for some reason it will shrink down while it’s baking (will still taste fine but look small and flat), whereas if you catch it before it’s done all its rising it will do a bit more in the oven and you’ll get a better shape and texture to your loaf. Either way it will be better than the ones with concave tops that my breadmaker insisted on turning out, after we’d seen the loaf rise handsomely all through proving and baking, only to give up in the last few minutes and collapse. Bake the loaf for 25-30 minutes, then take it out, remove it from the tin and knock on the bottom as if you’re knocking on a door. If the bread is ready it will make a hollow sound [it’s brilliant, honestly – my favourite bit every time! ], otherwise pop it back into the oven, tinless but upside down, for another 5-10 minutes. When it’s done, cool on a rack. DO NOT WORRY that the top feels really hard – you have not overcooked it and this will soften up as it cools. Also try not to eat it before it’s cooled for a little while at least, as it can give you a bad stomach. I realise it’s been a while since my last post (a different season, in fact, with a different blog background!) so I thought I’d do a bit of a round-up of things I’ve been enjoying lately. First of all, I’d like to introduce you to my new kettle. As you probably know, I’m a big fan of tea and this is, in my opinion, the ultimate tea-drinker’s kettle. It’s a lovely kettle in itself – very sleek and shiny and silver, and has useful features like a lovely spout that pours really smoothly, a slow-opening lid so you don’t get splashed with hot water if you need to refill it soon after use, and a transparent water measure so you can see from every angle how full it is, even when looking inside. However, its most useful feature is its variable temperature options. Like all cordless kettles, it sits on a base which is plugged into the wall, but in this case the base is host to a range of buttons which control the final temperature of the water, in order to bring it to the perfect temperature for various different teas. The fact is that the younger the tea when picked (green tea is the youngest, black is the oldest), the more readily it gives up its tannins, and if the drink becomes to tannin-heavy it tastes bitter, so a cooler temperature is required to get the best flavour. The instruction booklet includes a page listing dozens of different drinks and their ideal brewing temperatures, which I’ve photocopied and stuck inside the cupboard above the kettle for easy reference. Now I’m expecting a couple of negative responses at this point: the first being “Surely it doesn’t make that much difference to the flavour?” Well, after a few weeks of research (I bought the kettle over Easter weekend) I have come to the conclusion that for me, it does. Even the teapigs’ Mao Feng green tea, which I’ve raved about before as being nicer-tasting than other green teas, tastes better when brewed at the correct temperature – before I was just boiling the kettle, leaving it to go a bit off the boil and then adding the water so it was usually still too hot. The second objection I’m anticipating, from those who have now googled this appliance, is “That’s a lot of money for a kettle!” And it is, there’s no denying that (I received an unexpected windfall and we decided to buy it out of that). But would a lover of coffee meet with the same reaction when treating him/herself to a gorgeous, state-of-the-art coffee machine with all the available bells and whistles, or would the response be more of a “Lucky you!” That’s the way I’m looking at it – a machine to make myself the best cup of tea I can get, whatever kind of tea I want. I don’t drink coffee as it makes me ill (and, actually, even before when I did used to drink it I always found it a slight disappointment because the taste never lived up to the beautiful aroma! ), so teas are my “thing”. And since my kettle features a “coffee” button too (95C) I feel it’s far more hospitable than a prejudiced and exclusive coffee machine! As a result of this purchase I’ve been introduced to two new kinds of tea. The first is Oolong, which I can recommend if you’ve never tried it! There’s an “Oolong” button (90C) on the kettle and apparently this is the only kind of tea which brews at that temperature, so to make full use of my kettle’s features I decided I needed to try some. I was placing a repeat order of Mao Feng so I added a sample pack of teapigs’ Tung Ting Oolong to my order and my only regret is that I didn’t order a bigger pack! It is truly delicious. A few days later a friend, who had noticed my Oolong recommendation on Facebook, handed me a packet of teabags and told me that if I liked green tea and Oolong, I needed to try these. The tea in question is Kukicha, or Japanese roasted twig tea. Sounds… unusual, doesn’t it? I have to admit I was dubious, especially when I read that it really is made of twigs (specifically, the stems of the tea plant rather than the leaves), but I do really like it. I totally disagree with my friend’s recommendation based on similarity to green and Oolong, because I don’t think they’re at all the same (despite the fact that Kukicha is classed as a green tea). For me it’s actually closest to coffee, in a strange way, because of the definite aroma and flavour of roasting that it has. I’m pleased, anyway, to have added these two teas to my range, not least because I’m trying to restrict my calorie intake for a little while following a period of over-indulgence (in passing, the Hilton Gateshead gets an impressive Cream Tea award score of 17) and very little exercise over Easter, and I find that drinking a large mug of milkless tea is a good way of preventing snacking. The Bookworm and I are still enjoying a bit of one-to-one time together on our journeys to and from piano lessons on a Saturday morning and have been taking advantage of my Audible subscription to provide entertainment en route. We’re about to start listening to a dramatisation of Neil Gaiman’s Neverwhere tomorrow, but recently we’ve enjoyed Welcome To Our Village, Please Invade Carefully starring Julian Rhind-Tutt as a very polite alien commander who’s observing human life in an English village before he rolls out his invasion world-wide, and before that four series of Elvenquest, a Lord of the Rings parody with Stephen Mangan and Alistair McGowan. And Southern Daddy and I were able to see Mr McGowan in the flesh a couple of weeks ago, appearing in Pygmalion at the Theatre Royal. Once again we received theatre tokens for Christmas and the only difficulty has been narrowing down the choice of plays to see this year. We thoroughly enjoyed our first selection – particularly McGowan’s energetic Henry Higgins – but are still choosing between The Mousetrap and Jeeves and Wooster later in the year. In the meantime, though, we are planning to see The Handle Bards again. Unfortunately they are doing their UK tour in reverse this year, which means that by the time we’re further south, where we caught them during last year’s glorious summer, they’ll be in Scotland, but they’re appearing near us in early July so we intend to treat the girls to a late night and see The Comedy of Errors. I strongly recommend you see them if you can, so check the dates on the link above and see if they’re appearing near you! That’s all, I think, for now – I’ve been working away at my Magimix experiments with mixed success, so look out for another post on those soon. So, as planned, I’ve managed to try a few recipes in my food processor over the past month. Four, to be precise. The first one was to try my usual chocolate chip cookie recipe (from the Hummingbird Bakery book) in it, rather than using a hand-held mixer. This was a relative success, although it didn’t go exactly to plan. I chopped the chocolate in the small bowl, which was good as it usually takes much linger to do by hand. Then weighing up the ingredients and the instructions (which are really for a stand mixer), I decided to use the dough blade in the main bowl, so put in the starting ingredients and got to work. The dough blade, for some strange reason, has very short blades, which meant that a lot of the mixture was left round the edge and not picked up by the blades. I changed part way through to the regular metal blade (a bit of a messy procedure, but worthwhile) and continued: the remaining mixtures was caught up in the dough after that and it worked fine. When I came to add the chocolate, however, where a dough blade would simply have folded it in, the sharp blade of course shredded little bits off it at the same time, mixing lots of chocolate crumbs into the dough along with the bigger pieces. This turned out ok in the end, though, as they flavoured the biscuit part of the cookies and made them a bit more chocolatey. Probably not better, but no worse either. On balance I shall probably not use the Magimix for cookies again, as it didn’t really save me any time over my usual method with my hand mixer being pretty powerful. I might use the small bowl for chopping the chocolate though. My next experiment was to make dough for scones. I would say this was an unmitigated success. I was amazed how quickly the ingredients were whizzed into fine crumbs (the booklet suggested the dough blade for scones, but after the cookies I eschewed that in favour of the sharp blade), especially as I’d forgotten to take the butter out of the fridge in advance so it was still cold. I added the liquid through the spout as the motor was running and the whole thing was ready in moments. I was concerned the scones wouldn’t be as light as usual, as the mixture wasn’t as wet, but I needn’t have worried. They probably benefited from not being handled quite so much. I made heart-shaped scones for a Valentine’s afternoon tea. The recipe I used would have made 6 large scones, but I made 4 large and 4 small as I wasn’t sure how they’d turn out. I processed 8oz (225g) self raising flour, a teaspoon of baking powder, 1.5oz (37.5g) butter and 1oz (25g) caster sugar until they were fine crumbs (really quick! ), then, with the motor running, poured a beaten egg (minus 1 tbsp reserved for glazing) made up to 5floz (150ml) with milk down the spout to bind the mixture. I turned it out onto a board, flattened it with my hand and cut out my hearts, which I glazed with the reserved egg and baked for 15 minutes at 200C (in the Over-Zealous Oven this made them very brown, but they weren’t burnt or dry). They came out unusually rounded and bun-like for scones – not sure if this was the heart shapes or the food processor preparation, but as I’d broken my maxim If you’re going to tweak a recipe, make sure you only tweak one thing at a time, there was no way of working that out! The next thing I made was the most disappointing, not least because I’d made it from the recipe book that came with the machine. 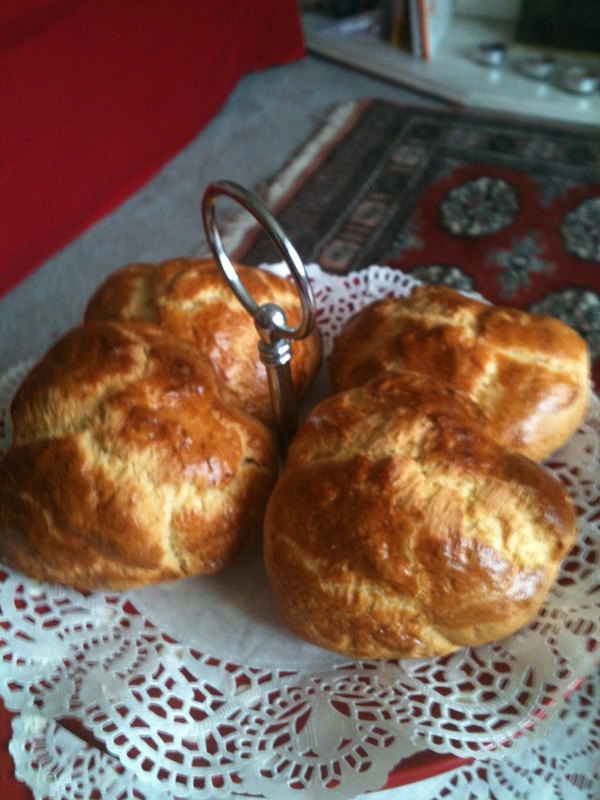 The Butterfly and I decided, as it was half term, to try a plaited brioche. We followed the instructions about dissolving the yeast in warm milk, making sure it wasn’t too warm, then adding it to the other ingredients and processing. All went well with the proving and plaiting but then we hit a snag. Prove for a second time in a very low oven, said the recipe. But what is a very low oven? I know from previous baking projects, involving Mrs Beeton recipes and the like, that very low often means about 110-120C, but that seemed a bit warm for proving bread, so I went for 50C, which is the lowest setting on the O-Z O. After half an hour (as stated in the book) I removed it – not looking very different – egg-washed it and returned it to a hotter oven for its allotted baking time, but when it came out it looked rather sorry for itself. We let it cool and then I sliced it and found – as expected – it was rather dense-looking and under-proved. It didn’t taste bad, and we are it with jam for tea, but it was much less sweet than we’re used to and had a rather doughy, steamy flavour. Undeterred, I’ve been looking at alternative recipes and plan to try another one soon with longer, slower proving at room temperature. On the plus side, the dough blade did prove effective for this one! Finally, today I made an apple crumble on the spur of the moment. I was making pot roast beef* for Sunday lunch and, as I’d put it all in the slow cooker overnight, there was only the Yorkshire pudding to be made (Southern Daddy always does the steamed veg at the last minute) and I found I had time to think about a pudding. I used Delia Smith’s recipe, but made my own adjustments – I used eating apples (because it was all I had), I didn’t add any almonds to the crumble (because I hadn’t any), I did add sultanas to the apples (because I like them) and I made half the amount of apple mixture but the full amount of crumble (because we were only four for lunch, but I like a good thick layer of crumble with my fruit!). I could probably have used the slicing attachment and the medium bowl for the apples, but I only thought of this after I’d done most of them! But I made the crumble in the large bowl really easily and was very pleased with the way it turned out – much quicker than rubbing in by hand when you’re doing something on a whim and don’t have much time. So, that’s my first Magimix report. I already have plans for a focaccia loaf next week, as well as the second brioche, and I’m constantly on the look-out for more ideas! * If you are interested in a recipe for the slow-cooker pot roast, this is what I used. It’s an amalgam of Delia Smith’s and Martha Stewart’s recipes, adapted to suit the veg we had in. Serves 4ish. In the bottom of the slow-cooker dish, mix 1 tbsp cornflour in 2tbsp cold water. Put in 6 shallots, peeled and halved, 2 parsnips and 2 sweet potatoes, all peeled and chopped, and 2 celery sticks, each cut into 3. Season with salt and pepper and toss with the cornflour mixture. Season a 600g brisket joint and sit on top of the vegetables, then pour over 2 tbsp Worcestershire sauce. Put on the lid and place the dish in the slow-cooker. Set to Auto. (I cooked mine for 15 hours and it came out nice and moist and completely cooked through. Obviously if you’re desperate to have your meat rare you’ll have to cut down the cooking time). Remove the brisket and leave under foil to rest for 30 minutes before carving. Keep the vegetables warm and bring the liquid to the boil in a pan and serve as gravy. If you want more gravy you could press the vegetables through a sieve into the juices. The Year of the…. Magimix? Hello, I’m back! Have you missed me? It’s been almost a month, but I’ve been poorly for a bit of that time and, without the Austen-themed reviews to spur me on, I didn’t have all that much to write about. We spent a few days staying with my parents at the start of the year, as the girls and Southern Daddy didn’t have to start back until 6th January, which felt like a real treat as it’s often quite a rush back after New Year. We booked our family summer holiday, which this year will be in a self-catering lodge in Norfolk. I had a good day out at the Sage (now an annual event), learning and then performing choral songs from light operas with hundreds of other people and accompanied by the Royal Northern Sinfonia, which set me up for another season’s singing with choir (whose rehearsals resumed the following week). I booked a spa session in February, with a voucher my parents gave me for my birthday – two hours at a hotel spa (accompanied by my lovely Stepmum) including a massage and a pedicure – looking forward to that! I switched my online grocery deliveries to Waitrose (sounds like no big deal but when you’ve been “locked in” to a 6 month delivery plan with a supermarket who was rapidly becoming more and more disappointing, it’s a really nice feeling to be freeeeeeee! Plus, Waitrose brought me a free bottle of champagne with my first delivery and 4 discount codes for subsequent orders, and I’m very happy with the way it’s going. We had a Burns’ Night Supper with haggis, “neeps and tatties ” and a very delicious cranachan. SD gave me my Magimix food processor for my birthday several years ago. In those days my kitchen was full of clutter with no available workspace, and any gadget I happened to own sat out somewhere. I used the Magimix reasonably often. But when my friend Wonderwoman helped me to blitz my house and make it less cluttered and more restful and generally nicer to live in, the Magimix and its accessories were relegated to a cupboard because there wasn’t the space to accommodate everything and I used things like the breadmaker more. And so I all but stopped using it, because it was such a hassle to drag all the pans out of the cupboard to get it out (it’s heavy), and fish out the appropriate blade/attachment, and it’s been languishing in there for a few years now. Today, though, I wanted to make a chocolate beetroot cake (it’s from this book, but I think for copyright reasons I’m not meant to give the recipe out here) which requires the beetroot to be blitzed in a food processor. It has to be a food processor – I’ve tried it in the blender, with very messy results. And as I was getting it all out, and cleaning the sticky, kitchen-y grease off it, and cutting my hand on one of the blades, I thought I should use this more, and not let it get so grubby through lack of use. And then I thought I haven’t used the breadmaker in ages, because really the bread it makes is pretty poor, and so I only really use it to make dough, and to be honest a machine which only makes dough doesn’t really deserve a place on my counter, especially when I could make dough pretty easily in this instead. So then I cleared off the recipe books, old paperwork and Christmas card from 2012 from on top and took my breadmaker and stuck it in the garage ready to be thrown out/given away if anyone wants it, and put my newly clean and sparkly food processor in its place. Apologies for the appalling photo quality, the current state of the weather means we’re getting practically NO natural light at any time of day. So now I need to use it. I plan to find, try out and share recipes this year which make as much use as possible of this versatile gadget. And I plan to find out what all the attachments do, having only ever used the big whirly blade and one of the graters. 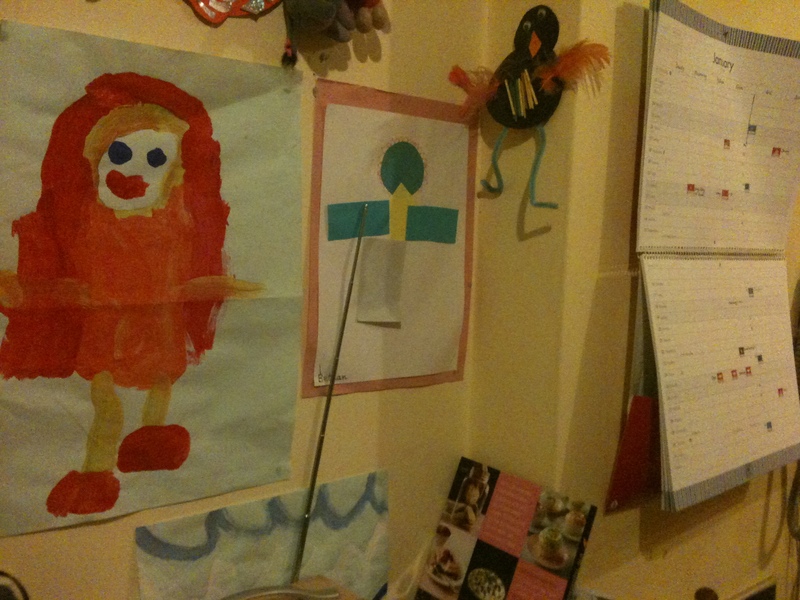 I also plan to replace the children’s artwork, which has been on display since approximately 2005, with a shelf to hold all the accessories (in the case behind the machine) and maybe some of my favourite recipe books. And Southern Daddy is hoping that this doesn’t result in our redecorating the kitchen! 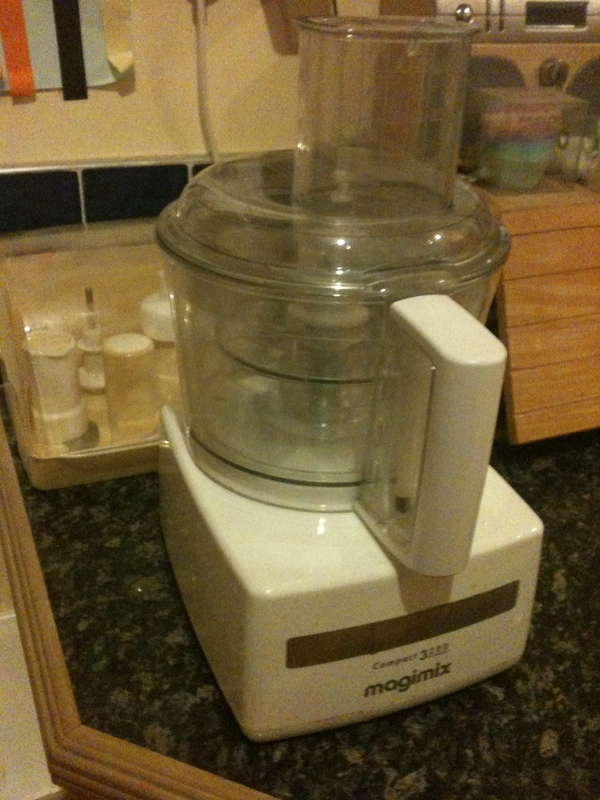 So I look forward to sharing the Year of the Magimix with you as time goes by, and please, please do share any food-processor-based recipes with me that I might like to try! So, it’s the last day of 2013 and time for my final review as part of the Pride and Prejudice Bicentenary Challenge. As you’ll see from my original plan, I had various different ideas about what I’d review for this challenge over the year, some of which have come to fruition and some have not, largely owing to the difficulty of getting hold of some of the books (they were unavailable at the library and some belt-tightening in the family finances prevented me from buying them). However, other opportunities have presented themselves at just the right time, and this final review is of one of those. Death Comes to Pemberley by PD James was published in 2011, an imagined sequel to Pride and Prejudice. If all had gone according to plan, I’d have read it in January of this year with my reading group, but I knew early on that I wouldn’t be able to make the date chosen for the meeting and chose to catch up on some other reading rather than read the book I was not going to be discussing. So it was that I approached this BBC adaptation fresh to the plot as well as the casting and production, meaning that there will be no reflections on how the series stands up against the book. By all means get in touch and let me know what you thought, if you’re in a position to do a comparison. Several years have passed since Lizzy married Darcy and they are now the parents of a small son and live a happy family life at Pemberley. Preparations are underway for a large party and a ball (it’s going to be so big they don’t have room for all their guests to sleep at Pemberley) and the Darcys’ main concern is over the two suitors for the hand of Georgiana – one of whom she likes a lot more than the other. I thought this part was acted really well and the humour of the resentment between the two gentlemen was brought out to great effect. Suddenly, however, things change. 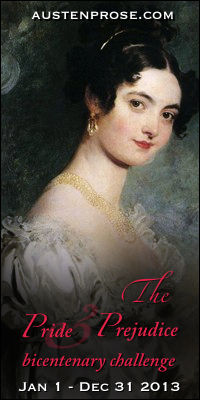 Lydia Wickham – who was travelling with her husband to Pemberley uninvited as a “surprise” for them all – arrives in hysterics because Wickham is missing and she heard shots in the woods. On investigation it turns out Captain Denny is dead and it seems highly likely that Wickham is the murderer. As well as following the development of the case, the story focuses on its impact on the household at Pemberley and in particular Darcy’s relationships with his wife and sister. I felt that the existing characters – by which I mean those whom we know from Pride and Prejudice – were developed in a believable way, especially Wickham as the incorrigible rogue motivated alternately by the pursuit of his own pleasure or the desperate attempts to cover over his mistakes, whose past was now coming back to bite him as nobody believes in his innocence. We were given more of an insight into his relationship with Lydia and in particular her decision to turn a blind eye when it came to his extra-marital dalliances. The new characters introduced by PD James fitted well into the setting and there was nothing much which struck me as confusing or at odds with Austen’s world. However at one point during the trial I did question the behaviour of the judge in his refusal to allow Wickham’s lawyer to raise objections – I couldn’t work out whether he was biased in favour of the prosecution, or if those kinds of interruptions just weren’t permitted in Austen’s day. But it was puzzling, whatever the reason! The plot strands were enjoyably woven together as the story progressed and it all finished in a most satisfactory manner with a last-minute revelation and the inevitable race against the clock to resolve matters. All in all I really enjoyed this three-part production (which surprised me, as several people I know hadn’t liked the book). My main disappointments were that Colonel Fitzwilliam was dropped rather suddenly from the story and did not appear in the final summary of “what happened next” to everyone, and that Lady Catherine de Bourgh only featured very briefly. Everyone in my family thought that we’d have liked to see a lot more of her, played as she was by the excellent Penelope Keith in a very effective yet understated way with not too much of the Lady Bracknell about her (anyone who’s planning any adaptations of P&P in the future would do well to bear her in mind for the part!). So that’s my year of reviews finished. I’ve really enjoyed it and read a few things I wouldn’t have otherwise so it’s been fun and enlightening. I wish you a Happy New Year with minutes to spare (in the UK at any rate!) – see you all next year! All my gratitudes from 2013. What a year it’s been.